- automatically select "degenerate UVs"
AC3D is now 64-bit so that you can enjoy working on larger models (requires a 64 bit operating system). 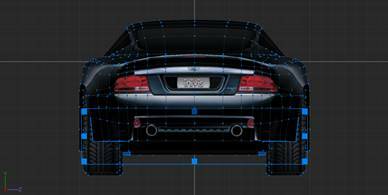 AC3D 8.3 imports a huge number of 3D file formats. Some of the existing file format support has been updated so that models load faster. The number of image formats has also been extended. Degenerate UVs? Are your textures causing "marching ants"? When there are problems with a texture-map they can be very hard to spot. Sometimes, problems will only reveal themselves in a final application that's displaying your 3D model, and then only on some, but not all, graphics cards. Problem areas can show up as blank areas or fuzzy moving pixels - "marching ants". These are generally caused by "degenerate UVs" - essentially texture coordinates that don't map to a valid area on the texture/normal map. AC3D 8.3 includes a function to select all surfaces which have "degenerate UVs". 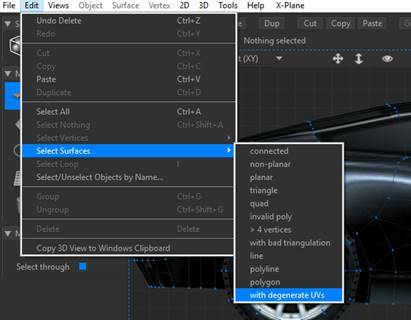 Simply switch to Surface select-mode and then choose menu Edit->Select-Surfaces->with degenerate-UVs. If there are any badly textured surfaces, they will be selected in AC3D so you can easily see where they are. The new Thicken function (Object menu) adds the powerful ability to turn single layer objects into fully-shelled 3D objects with a defined 'thickness'. You can choose the direction of thickness (in, out, both) and specify a final thickness for the shape. Extrude has now been simplified. Using a combination of Extrude, Thicken and Extrude-edges (Vertex menu), it's now easier to add extra surfaces without introducing unwanted additional geometry. For a full list of other changes, see the 'changes' list that comes with the AC3D installer. 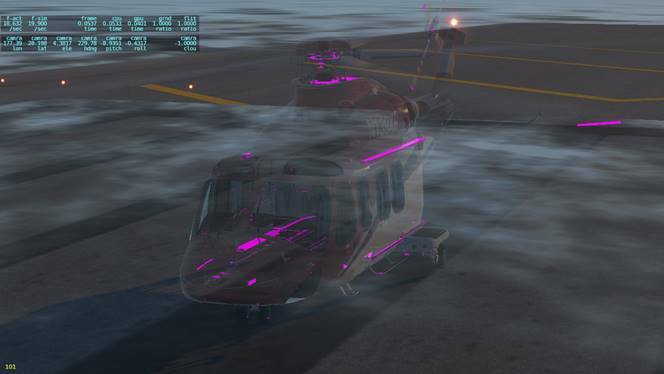 Where is the X-Plane plugin? Are you still supporting Linux? Of course, we'll have the Linux version ready soon - we'll let you know.